This section is dedicated to the late Mr. Rod Remlinger (- March 23, 2009) (http://remlinger-bhutan.weebly.com) who specialized in FDCs of Bhutan and from whose collection the majority of the illustrations come that are presented here. A special thanks goes to Carol Endholm (ysci@comcast.net) from Washington, USA who administered Rod's philatelic estate and kindly furnished the scans. The Bhutan P&T was founded on 10.10.1962. It was a philatelically naive post office department with regard to first day covers (FDCs). Some early 1963-5 FDCs have no dates - only a pictorial cancellation mark.The first two sets of stamps issued by Bhutan, became valid for postage no earlier than on October 10, 1962, despite reports. 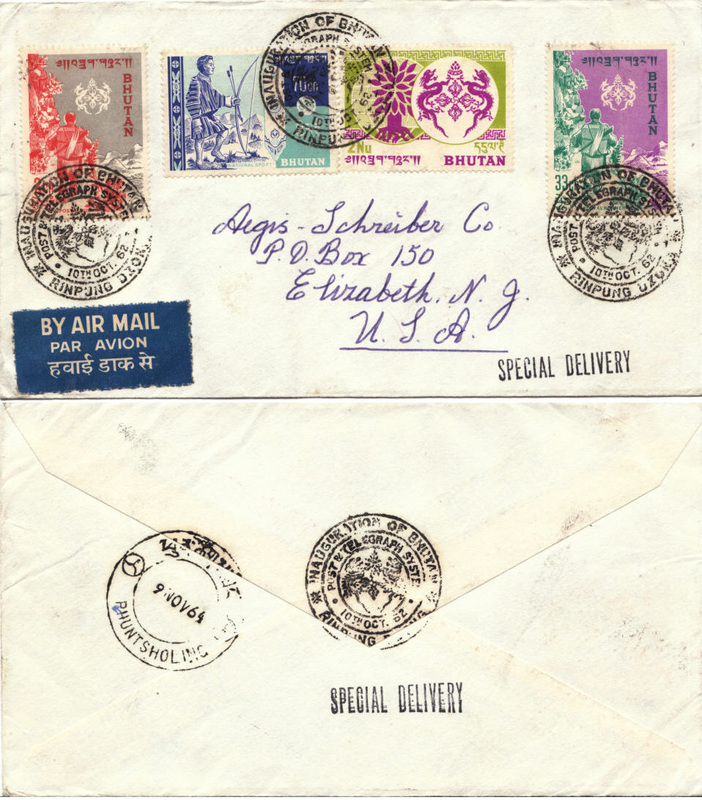 Copies of the stamps made their way into the market through Bhutan's agent in distributions made to the press as early as May 1962 and not through sales in Bhutan. A few copies of the first issue stamps are known affixed to invitations to the "Inaugural Ball" for the opening of the post office at Phuntsholing, and cancelled with the Inauguration postmark, (pictured on year pages lower in this menu). Thes invitations had to be have been prepared prior to the festivities on opening day in order to mail them out (by Dzong courier and through Indian post offices) and have them arrive in time as advance notices. It is still, to this day, customary in Bhutan to sell and have post offices treat older, un-mailed FDCs (with FD-cancelled stamps on them) as having mint stamps conveniently affixed to envelopes and ready for mailing. The cover at the left is an early example of this practice. The actual date of mailing was 9 November1964 from Phuntsholing (southern Bhutan on the Indian border) and not from Rinpung Dzong P. O. in Paro (central Bhutan), indicated on the commemorative cancel. The first post office opened at Phuntsholing. The PO at at Paro didn't open until November 5, 1962. In other words, the cancellation is from a post office that didn't yet exist! In fairness, it must be noted that the government established the "Development Wing" in Paro, from where the establishment of the post office was managed. FDCs of this first issue that are actually addressed and mailed are almost always found with no FD of issue cancellation and no additional "CDS" (cancellation date stamp) marking. The practice of canceling with a town cancel later on a prepared but unmailed FDC is merely to provide a date on which the stamps on the FDC were actually used for mail entering the mailstream (finally delivering what they were purchased for).